In the last few months, not one, but two new Japanese cafes have popped up in Footscray. The first is Ebi Fine Foods in Essex St, way over Gordon St, whose fabulous pork belly I have fallen head-over-piggy tail in love with. 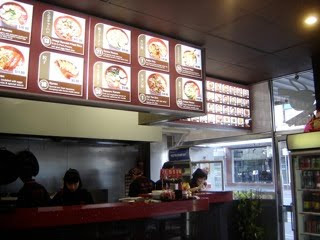 The second is Sekai Japanese Ramen, which has opened up on Hopkins St, nestled within Footscray Market. I just can't resist pictures of food. Ebi may have a snazzy digital photo frame in the window that scrolls through shots of its dishes, but Sekai made my heart flutter with its total sensory overload of pics! Complimentary tea is forthcoming when you sit down. I don't think it's run by Japanese people (the menu has some oddities like wonton noodle soup), but then again, neither is Ebi, and it doesn't detract from the deliciousness at that particular restaurant. I so wanted to follow in the footsteps of the Ramen Hunters, but I couldn't go past the yasai udon. For a long time, every time I went to the city I would eat this at one of the Japanese cafes along Swanston St. Udon are thick wheat noodles, and in this particular soup they come topped with a variety of vegetables. 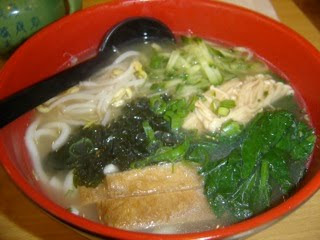 It is delicious and makes me feel virtuous, although I must say the MSG burn afterwards at many places is disappointing. The soup here was good. The noodles were a little overcooked and the broth could have done with more punch, but the toppings were really quite nice. 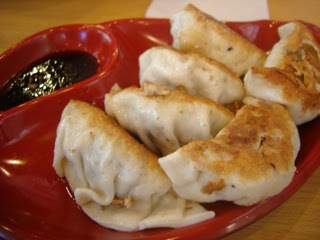 These gyoza were great, though! The filling was a spunky mix of pork, cabbage, and ginger, and their bottoms were so crispy and delightful. The prices here just can't be beat - most things are $10 and under. 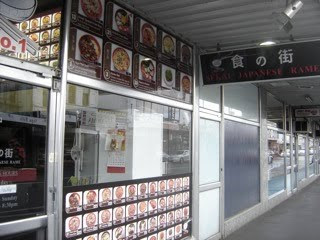 It's certainly not the best Japanese in Melbourne, but it's fun to have a different option when you're out doing your shopping. I like that it opens out on to the market, and I hope that people that may not otherwise shop there enjoy the experience of it as they eat their lunch. 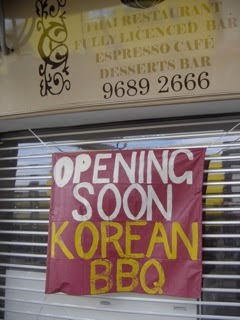 In other Footscray news, Thai Tho is closing down and a Korean BBQ joint opening in its place. Excitement plus!!! 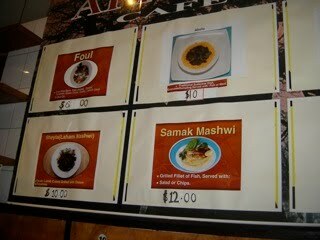 I'm bummed I never got to try Thai Tho, but it mustn't have been that mind-blowing then, right? I am here in the house where my husband was born. Slightly weatherbeaten but proud homes line the street, which is utterly quiet, the silence broken only by a passing car. Later on, evening will fall. The cicadas will begin their deafening roar, and the smell of burgers on the grill will begin to drift enticingly through the neigbourhood. Out on the porch, "bloody" in hand (Bloody Mary) - it is so peaceful here in the American Midwest. As I will be here for a while, I put out the call recently for submissions to Footscray Food Blog, so that we could keep celebrating and sharing the food of our wonderful suburb and surrounds. 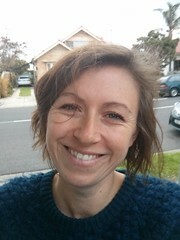 Eileen and Phil have very kindly and eloquently responded, with a review of one of their faves, African Taste in Seddon. Thank you so much, and enjoy! There’s a warm, humbling ambience when you walk into African Taste. The décor is basic but the friendly welcome from the café-bar owners – a big smile and recognition that we’ve eaten there on other occasions – is more like a homecoming. 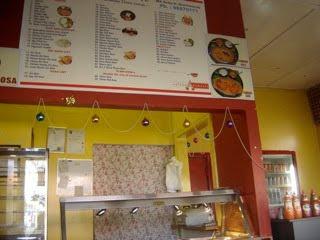 African restaurants, predominantly Ethiopian, are dotted all over Footscray and they offer traditional cultural cuisine. African Taste is a great addition to the area. The food here is inspired by Chef Ben’s country of origin Ethiopia, but with a hint of difference - all dishes are a modern take on the traditional cuisine. For instance gnocchi, a well known Italian staple, is made here the African way using barley. The gnocchi are then pan fried and tossed through a creamy sauce, rich yet light, topped with natural yoghurt. You can have them just as described or with diced lamb, fish (Chef Ben’s favourite), or by request with ricotta and spinach - yum. The African Enchilada is a revelation. A wicker covered ramekin holds tender pieces of chicken and torn pieces of flat bread, oven baked in a creamy, cheesy sauce. The flat bread soaks up the flavours of the dish and is a wonderful addition. This dish is a surprise and utter delight. We accompany our two mains with an African Taste salad – a simple lettuce mix with tomato, cucumber and pieces of toasted pita bread tossed in a tangy lemon, oil and sumac dressing - simply delightful. The Harar Beer we order is perfectly refreshing and goes well with our meal. Wine is also available by the glass and bottle. For dessert, we sample the baklava. It’s a delicately sweet ensemble of nuts, filo pastry and syrup - sublime. We devour this with coffee, served hot and strong to our liking. Ethiopians are well known for having pride in their coffee and this cup doesn’t let us down. While in traditional Ethiopian culture it is custom to leave some food on your plate after finishing your meal, Ben prefers to see empty plates at African Taste. 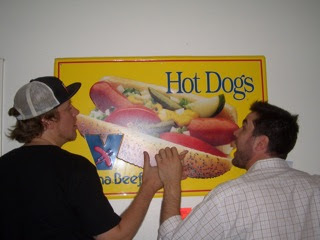 The food is so delicious here that we never have any problem clearing our plates, much to Ben’s appreciation. Everything on the menu at African Taste, from the homemade chilli sauces to the luscious desserts, is delicately crafted by Ben, a professionally trained chef. It is clear from chatting with him and his wife Sunny that their café-bar is not just a business venture but a way of sharing a passion for good food, and it seems to come naturally to them. Ben is often chatting to customers and you can see his passion for food in his broad smile and expressive hand gestures. It’s a pleasure to be able to chat with the chef, usually hidden in the kitchen, and to sample Ben’s lovingly made, wonderful culinary creations. 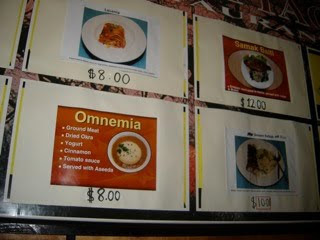 A meal at African Taste is a memorable experience with beautifully cooked food and friendly service. Thank you both so much! I have not tried African Taste but am so excited to do so soon. I do love all the traditional Ethiopian fare available in Footscray, but it is also exciting to find riffs on traditional themes. When accompanied by delightful service, so much the better! 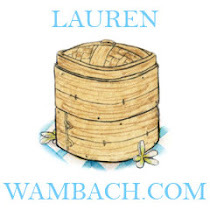 If you too would like to consider submitting a review, with or without photos, or even a recipe using an interesting, locally obtainable ingredient, I would be so appreciative. I would like to leave you with a wonderful quote that Eileen and Phil had at the bottom of their email. What lovely words to reflect on. I had high hopes for this month's IIP (a worldwide blogger event hosted by penny aka jeroxie of Addictive & Consuming, another local Melbourne food blog). The theme is tacos, and I pulled out my Diana Kennedy Mexican cookbook and planned to make carnitas, crispy shredded pork, by poaching the meat until it was very tender and all the water evaporated, and then shredding it and frying it in its own fat. Given that as you read this, I will be in my own personal hell - about to undertake 3 separate flights, by myself, with my 3 kids under the age of 5 - I think cooking anything other than grilled cheese sandwiches this week was somewhat ambitious. Droll wit that I am, I had intended to start my post with my most embarrassing foodie confession, my beloved taco kit, before saying, "Just joking, here is my brilliant recipe." 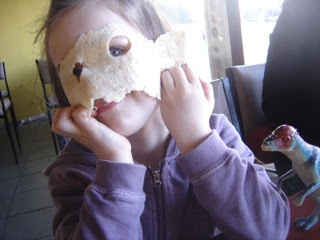 But the more I think about it, Penny's International Incident Parties have, for me, been about sharing the things my family loves with the world, and potentially inspiring other busy people, parents or otherwise, that interesting, multicultural food is not hard to make. This post will at least tick the first box! The fact of the matter is, much as it is a total bastardisation of proper Mexican food, the taco kit has a very special place in my heart. When I am feeling fragile, the happy red and yellow box is like a security blanket. It reminds me of my childhood. My parents divorced when I was about 12 and we subsequently spent every Sunday with my Dad. He would often make tacos from an Old El Paso kit. The table would be covered in white bowls with a myriad of colourful fillings - the meat, with its violently-coloured orange oil coalescing around the edges; crisp shredded iceberg lettuce; yellow grated cheese; bright red diced tomato. As a young child, it was the perfect meal because you could fill each taco as you chose, and in the bunfight that ensued after the hot shells were placed on the table, no one noticed if you ate any vegetables. When I am feeling frazzled, there is something comforting about pulling out this "magic box" that has everything you need inside (taco shells, seasoning, and salsa) plus a handy list on the front directing you to purchase 500g of meat, cheese, and lettuce. Sometimes we crave that for life. When faced with a difficult decision, it is wonderful to have friends and family to talk it through, but sometimes I want to cry, "Someone, just tell me what to do!" Some friends of mine are very religious people who live their entire life to the letter of their religion, striving to emulate their prophet right down to the way he cut his nails. My free spirit rails against this. It seems such a waste of human ingenuity, but at the same time, I do see the appeal. Follow these steps, and everything will be perfect. 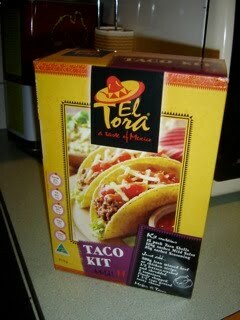 The taco kit is my secular response to that same fragile human need. Thanks for indulging me! I am so excited for my upcoming trip to the USA and all the fabulous Mexican and other Hispanic food. Even right out in suburbia where I will be, there are fantastic, authentic taquerias and I am going to totally overindulge in tacos el pastor the day I land. I look forward to having all the ingredients at hand to try out all your fabulous taco recipes! 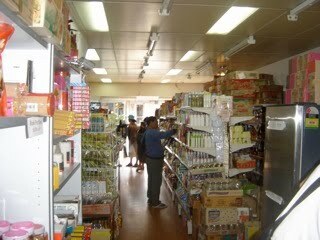 I really dislike terms like "Asian grocer" and "Indian shop," although I do use them. My family think I am oversensitive, but I don't like referring to the supermarket as the supermarket, the fish shop as the fish shop, while the place we buy our fish sauce and noodles from, and the other place we buy our lentils and spices from have ethnic tags, like they are somehow separate to us. I also grate at lazy, catch-all terms like "Asian" and "Indian," but the fact is, I can't detect the difference between a Chinese grocer and a Vietnamese one like I can an Eastern European-run deli and an Italian-run deli. *Sigh*... As my husband often says to me, I'm probably overthinking it. 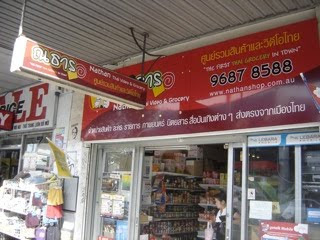 Nathan Thai Video & Grocery has made it easy for me - it's very clear that it's a specialty Thai grocer. All your favourite spice pastes are there, plus interesting pickled ingredients like tiny pea eggplants. The freezer is full of interesting goodies, like Thai sausages. They don't always have the brand below in stock, but do often have a homemade one in a ziplock bag, which is more of a sour style. 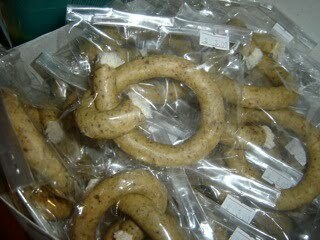 On Saturdays, they may have the sour sausages on the counter, ready for you to take home and leave to mature on the bench. My sister has tried these and said they were just great, very garlicky, and that they could have easily stood in for continental sausages. 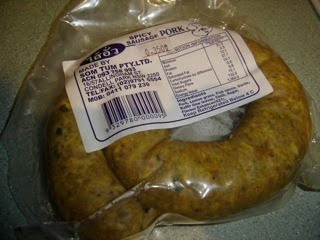 This Thai sausage is just delicious, "Thai-hot" and so flavoursome with big bursts of lemongrass and kaffir lime leaf. It's nice to have as an accompaniment to other Thai dishes with plenty of white rice, as it's very rich. Quiz for the day: What is this? Look closely - it's a sort of rope encased in a hard, fragrant coating, somewhat like clay or very stale biscuit perhaps. 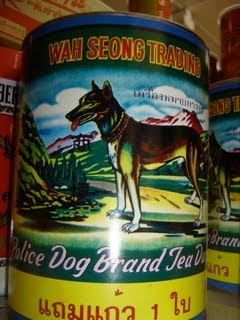 Is it A. a chew toy for the police dog on the tea canister; B. part of some sort of brutal colonic cleansing regime; or C. something else? Leave a guess in the comments section! In just a few days, I will be the seventh circle of hell - on an aeroplane above the vast Pacific Ocean, by myself, with my three children aged 4, 2 and 1. We are headed to the balmy summer of the warm American Midwest, to stay with Mr Baklover's family, and will be gone for a couple of months. While there, I hope to share some of my favourite American foods with you, like ribs, Italian beef sandwiches, and Chicago-style hot dogs. Unlike Australia, the USA takes an immense amount of pride in its junk food, and I don't say that facetiously. Far better to have a pizza, albeit a cheesy, pepperoni-studded one, made with love and care than the horrible, flabby examples thrown in a cardboard box that we often get here. 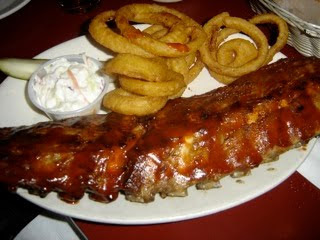 I also hope to share with you some of the cuisines that are unique to America, like African-American soul food. I want to make the most of having access to Hispanic ingredients such as fresh tortillas and a myriad of dried chillies. Rather than simply going off air, I hope you will instead enjoy some posts about American food, which is so much more than McDonalds and Burger King. But, dear readers and fellow bloggers - help me keep the home fires burning! 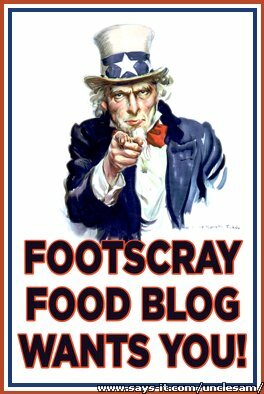 Please consider contributing to Footscray Food Blog with a review of a restaurant or a recipe based on an interesting, locally-obtainable ingredient, from anywhere west of Pascoe Vale Road. If you can take a photo or two, that would be brilliant. Email submissions to footscrayfoodblog@gmail.com. Don't be shy! I still have a few more Footscray reviews up my sleeve, so don't despair just yet. Thank you as always for reading! I do love writing this blog, and I love getting your comments and emails. As the inner West gentrifies, a process of which I know I am a part, I feel it is so important to encourage newer residents to engage with our local area, lest it become merely a dormitory suburb. Get out there, and get exploring! I'll leave you with Carl Sandburg's masterpiece, Chicago. Nicholson St, south of Hopkins, has always been my least favourite part of Footscray. In the past, there has been a dearth of good food options around this area, and despite the relatively recent makeover of the mall, it's still the place I would least like to sit on any given day. A woman, arms folded across her chest like a straightjacket, walks barefoot with quick, angry steps as she stares at the ground. Two men stride past, arms waving and eyes staring wildly, declaiming society's ills as their jackets billow out behind them in the wind. The evidence of drugs is all around. I'm not afraid for my safety; rather, it's just an unhappy place. Something is happening in the southern section, though, between Irving and Paisley. A formerly disused arcade between Nicholson and Albert Sts, now known as the Little Khartoum Arcade, has been reborn as a sandalwood-scented passage to Africa. I love to walk through slowly and window-shop - everything from kitschy Afro hair products, mysterious spices in unlabeled packets, and furniture that Franco Cozzo would covet. The positive vibe is now spilling out onto Nicholson Street, where new restaurants and cafes have sprung up between the forlorn shopfronts. Now, men meet in the street, smiling and shaking hands, before ducking in to their favourite cafe for a meal and a chat. Chan and I were craving some of Khartoum's luscious ful (a broad bean mash, not unlike Mexican frijoles or refried beans) but that Sunday, it was closed. African Cottage beckoned - a first here for me. 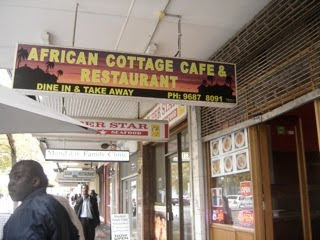 African Cottage have a mix of traditional Sudanese dishes and modern café fare, like lasagna and tortellini. 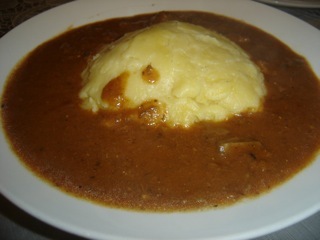 We kept it old school and went for ful and omnemia, a lamb stew. The chef presented us with this complimentary starter, a bowl of chicken broth. If you didn't already know, I am a total stock tragic. If I don't have at least two litres of it in the freezer, I get palpitations. I will scope the chicken shops at the market, not looking for who has the lowest price on breast fillets, but to see who has the meatiest bones. 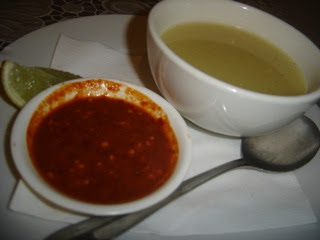 Full marks to African Cottage - this broth was brilliant! It was so comforting, flavoursome, and had a soothing, slightly thickened texture. Top marks for excellent ful, too. 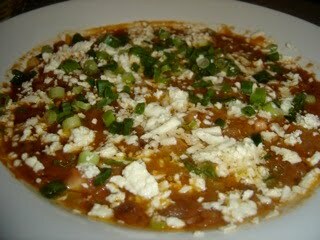 This was chunky, with soft broad beans and pieces of tomato, sprinkled with two types of cheese and tangy spring onions. It came with an impossibly large basket of pita bread to scoop it up with. The omnemia was a rich, slow-cooked, chunky lamb and tomato stew. It surrounded an island of aseeda, or cornmeal porridge. It was just fantastic! The stew was so rich, without being fatty at all. If you put a sprig of thyme on the edge, it could have passed for a hearty Italian peasant dish. The aseeda was much smoother than normal polenta, but just as tasty. 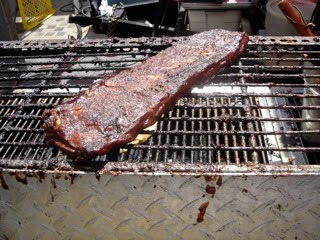 We pinched fingerfuls of it and used them to scoop up the chunks of meat, or just to dip in the rich sauce. The chef here is so friendly. They have a coffee machine and a range of African beers, too. 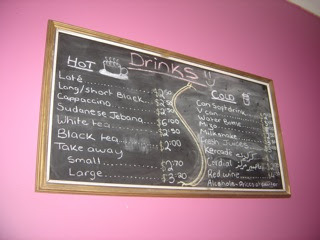 Check it out - the $2.50 coffee lives at African Cottage! Oh, and the bill? $7 each for two courses. That puts me in my happy place! What do you think of when you hear the phrase "Family Meal Deal"? Some sort of high-fat, high-salt junk food "treat", no doubt, marketed by fast food companies as every mother's dream "night off." For the record, this mother's idea of a night off is cocktails at Madame Brussels and associated debauchery, not a bloody variety bucket. However, I could be tempted with Dosa Hut's "Family Biryani Meal Deal," a mammoth pot of biryani proudly advertised on this little restaurant's front window. McDonalds, watch your back! 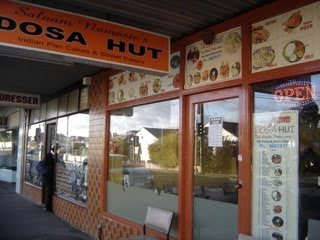 Dosa Hut, bolted on to the end of West Footscray's Barkly Village, have a staggering menu of South Indian treats. 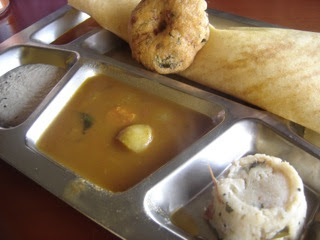 Choose from idli (UFO-shaped rice flour cakes), vada (crispy lentil flour doughnuts), or dosa (huge, paper-thin crepes made from fermented rice & lentil flours). If you are used to the familiar equation, Indian = butter chicken and rogan josh, it might come as a bit of a shock to find no curries on the menu at all! Masala dosa is one of my favourite foods of all time. The dosa is paper-thin and crispy, yet pliable enough to form a long cigar shape. Dosa Hut has a plethora of fillings - choose from egg, lamb, cheese, or even chocolate! To decipher the menu, "kal" dosa is one that is somewhat softer than normal, "podi" has a spicy powder, and "rava" is made from semolina. "Masala dosa" means that the dosa will conceal a dry-style potato curry, spiced with curry leaves, mustard seeds, and cumin seeds. Concealed within the folded dosa, Dosa Hut's potato curry was excellent, heavy on the delicious ghee and bursting with fresh spice flavours. It also came with a vada or lentil doughnut, which I usually avoid as in my experience they have a poor unhealthy-to-delicious ratio. This one was really good though, springy inside and crispy outside, perfect for mopping up the creamy coconut chutney. The little tower on the right is upma, a kind of savoury, wet, couscous-type dish mixed with whole spices and tomato. Unfortunately, Dosa Hut let itself down on the sambar, the spicy, thin soup that is so beloved in South India. This version was too watery and lacked punch. I normally avoid biryani, as it often tastes to me like nothing more than gluggy, oily fried rice. Not so Dosa Hut's version. Each impossibly long grain of basmati rice was separate and stained a multitude of hues from spices and saffron. 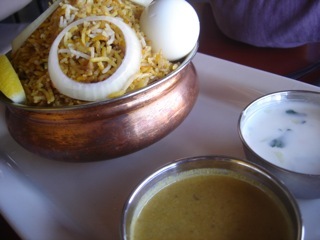 Within the pyramid of biryani lay nuggets of excellent, tender goat, redolent with cardamom. It came with very thin, so-so raita and an interesting peanut sauce. Be warned, though - it is chilli-hot and probably not great for kids.